I know its just been a couple of days back that we completed the Sep Mega BM with a Buffet On the table. Still, with the new month rushing in, we got to get on with the regular BM as well. For the first week, I decided to do a Mug Cake. This was inspired by a video in FB that I saw and rushed in to make it right away. I added more cocoa powder than suggested and Microwaved it for lesser time. With previous experience in my MW Oven, I never take the risk of cooking cakes for more than a minute. The cake was perfect with just 1 minute, however, I was forced to keep it for 20 secs more. I strongly suggest only a minute as more than that cooking time, you will end up having a biscotte on hand! This serves as a perfect dessert when you are short of time. Dusted with Icing sugar, it’s a perfect chocolate dress. This also makes a wonderful party dish, very quick to get it done. So sending it to my Anniversary Party for Kid’s Delight, celebrating 7 years of Spice your Life! In the Microwave Safe mug, take the flour, sugar, cocoa powder and Baking soda. Fluff together to mix everything properly. Then add the milk and combine. Now add the oil. Finally, add the dark chocolate chip and combine. If you feel the batter needs a little more liquid, add a few more drops of milk. Microwave for a minute. Let it rest for a few minutes to cool down. I microwave again for 20 sec, however, I felt the cake was done after a minute itself. Dust the icing sugar on top and dig in. This cake you get with the above measurement is quite big for single serve for an adult. Kids can easily complete it though. In the Microwave Safe mug, take the flour, sugar, cocoa powder and Baking soda. Fluff together to mix everything properly. Then add the milk and combine. Now add the cooking oil. Finally, add the dark chocolate chip and combine. If you feel the batter needs a little more liquid, add a few more drops of milk. Microwave for a minute. Let it rest for a few minutes to cool down I microwave again for 20 sec, however, I felt the cake was done after a minute itself. This is perfect for those sudden dessert cravings, quick to & yummy! I love these quick treats..for two reasons..one they are super quick, saves time. Two they satisfy the chocolate craving..and one can enjoy without sharing ???? Delicious for the late night craving. I love chocolate based desserts and this is super quick to satisfy the sudden cravings.Good one. 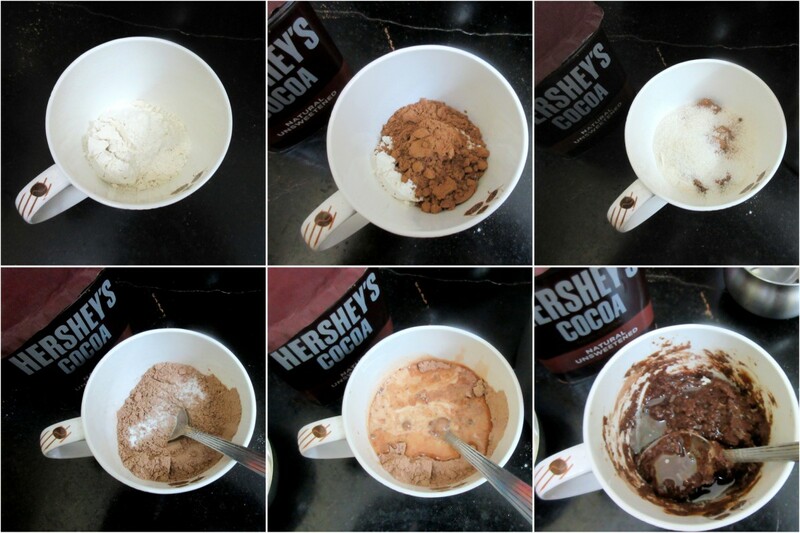 Fantastic mug cake,prefect for sudden cravings.. These are perfect for the sudden sweet cravings my husband and I usually experience on a weekend….am gonna keep this recipe safe! A quick mug cake to satisfy carvings. What a lovely chocolate mug cake Valli. My kids would love this one. perfect for a sneaky midnight snack..love it..